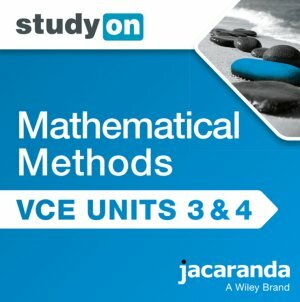 studyON VCE Mathematical Methods Units 3 and 4 is a comprehensive study, revision and exam preparation tool that delivers proven learning outcomes through a range of interactivities, videos and past VCAA exam questions. • Sit exams: VCAA exam questions from 2006 onwards, along with marking guides and examiner comments. Students receive instant feedback and can track their results at a concept, topic or whole-course level. • Concepts: Concept summary screens provide concise, in-depth explanations supported by relevant examples. • Read more: Hyperlinks direct students to more information in the Jacaranda eBookPLUS. • See more: Videos and animations bring concepts to life. • Do more: Hands-on interactivities enhance understanding of on-screen concepts and provide instant feedback. This title is included when purchasing the complementary Jacaranda eBookPLUS or Jacaranda Textbook + eBookPLUS. For more products in this series click here.